For a number of weeks I have been bragging about my homemade, almost free, DIY soft soap. Surprisingly, only a couple of readers had called me on the fact that I have been sending out teasers, one right after another. So okay, no more teasing. Today I am going to share with you my DIRT CHEAP SOFT SOAP. And by dirt cheap, I mean as low as 80 cents or less for a gallon jug of the stuff. Now I like a bargain as much as the next person, but this is so good and so cheap that I am wild and insanely crazy about it. And the best part about it is that I only had to purchase one item to make up a batch of this wonderful stuff – namely a bottle of vegetable glycerin. So how did I do it? Let me share the basic recipe. 5 Shop Emergency Essentials Sales for Fantastic Deals! 6 Are You Interested in Essential Oils? The basic ingredients of Dirt Cheap Soft Soap are bar soap, water, and glycerin. In addition, you can add some essential oils for fragrance but that is totally optional and not needed if you start out with scented bar soap. I used my Cuisinart for the first two batches which was pretty wild. The soap grated up up into a fine powder that floated about my kitchen. It smelled heavenly – clean and fresh – but it looked like smoke. In subsequent batches, I used an old fashioned box grater. I grated a full-sized bar of Yardley Oatmeal and Almond soap in less than 5 minutes. 2. 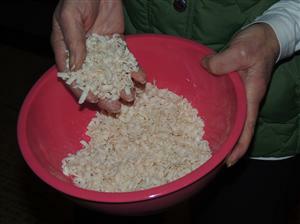 Place the grated soap flakes into a large pot and add the water and glycerin. I used filtered water (what I call Berkey water) because I did not want strange odors in my soap. And our tap water does smell like a hot tub if you know what I mean – pretty icky. 3. Put the pot on the stove and turn the burner up to a medium heat. After about a minute, you will see the flakes dissolve. This happened a lot quicker with my Cuisinart soap – say about 1 minute – but the grated soap only took a minute or so longer. At this point I took my whisk and whipped up my brew into a heavenly, bubbly froth. You probably do not need to do this but I had read on forums where the some homemade soft soap was more like snot (sorry) and I did not want that! I whisked away and practically doubled the quantity of soap in the pot. 4. Set your homemade soap aside to cool. Let it sit overnight or for a few hours at a minimum. Dirt Cheap Soft Soap (which I named, by the way) will get thicker as it cools. I have found that different soaps thicken differently. Some got too thick so I simply added more water the next day and whisked it up some more to blend it all together. 5. 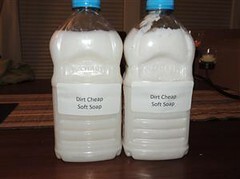 Pour your Dirt Cheap Soft Soap into containers. For each batch I used 2 re-purposed 1/2 gallon apple juice jugs as storage containers. I used a funnel which helps a lot. I then used the juice jugs to fill my counter top soap dispensers. The cheapest way to make this soap is to use freebie bars of soap that you have saved over the years from hotel rooms or in my case, cruise ships. I always take these little travel toiletries with me when I check out since I did pay for them, right? So maybe they were not exactly free but you know what I mean. I also used some scented gift soaps that were given to me years ago. I do not use bar soap at all so these have been languishing in a box under the sink for ages. The latest batch was made using a bar of Yardley Oatmeal and Almond bar soap that I purchased at the dollar store. I did add about 2 teaspoons of lavender essential oil to the hotel/cruise ship soap version but the scented soaps retained their pleasant smell without the need for anything else. And even the hotel soaps smelled nice but I happen to love lavender so there you go. Different types of soaps may produce different results. Do not be afraid to add more water if your soap is too thick. And also, don’t feel that you need to have fluffy soap. I just happen to like it that way. Experiment and have fun with it. The quantity may vary from batch to batch. It may be the soap, the humidity, the whisking – who knows? Expect some variability and go with the flow. I have not tried it, but if you are using a high-quality bar soap (perhaps one of those gift soaps), you may be able to leave out the glycerin. Like I said, I have not tried it and the glycerin was cheap enough. The basic recipe can be doubled or cut in half or even fourths. I have had the same success no matter what. At $6.46 for 4 ounces, I probably overpaid for the glycerin since you can purchase a full 16 ounces online for a lot less ($8 at Amazon). No worries, that still works out to 80 cents per batch and next time I will purchase a larger quantity to bring the cost per tablespoon down. (Remember, there are 2 tablespoons to each fluid ounce). The 4.25-ounce bar of soap made up 1 1/2 cups of grated soap so with each batch I had some leftover for next time. Working the math though, I come up with .67 cents per cup of soap (assuming you paid a dollar), so the total cost for a full gallon using purchased soap was $1.47. Compare this to the cost of a one-gallon jug of “Softsoap Moisturizing Hand Soap” at Costco for about $11. The Survival Husband simply loved this stuff from the get go. I had no idea he felt our day to day name-brand soft soap was drying and rough. Go figure. And me? I feel like a chemist when I stir up a batch and the clean up is a breeze. It is soap, after all. The other thing I want to mention is that Dirt Cheap Soft Soap is my name for this stuff. I made it up and I think it fits. I would love to have you try this and share your comments and experience with the rest of us. Let me know how it all works out. 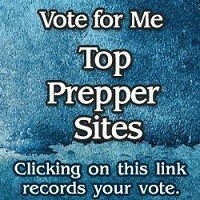 Thank you for voting for me daily at Top Prepper Websites! SUBSCRIBE to email updates and receive a free, downloadable copy of my e-book The Emergency Food Buyer’s Guide. Bargain Bin: If you are planning to mix up some Dirt Cheap Soft Soap, check around your home. Chances are you already have everything you need except, perhaps, the glycerin. NOW Solutions Glycerin 16-Fluid Ounces: Compared to what I paid, this is a real bargain. I have been purchasing the NOW brand of essential oils and have been very happy with them, even though they appear to be budget prices. NOW Foods Lavender Oil: I tend to use cheap essential oils in my soap products since their use is for smell only. (Come on, really. The soap goes right down the drain!) Pick you scent. I happen to like lavender but seems to me that peppermint, orange or rose would work wonderfully as well. 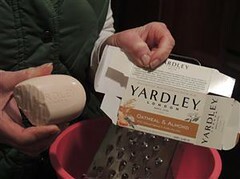 Yardley of London Naturally Moisturizing Bar Soap: The Yardley soap worked well and can be found at the dollar store but the available scents are limited. Amazon or even your local drug store will have more variety. Box-style Hand Grater : As easy as it was to use the Cuisinart, it just felt “better” to grate the bard soap by hand. OXO Good Grips 3-Piece Funnel and Strainer Set : This is the set I have in my kitchen. OXO products are known for their quality and usability. And here is a hint. If you purchase an OXO product and don’t like it, send them an email or give them a call and they will refund your money. I bet you did not know that! Dr. Bronner’s Sal Suds Liquid Cleanser : I know that Dr. Bronner’s Magic Castile soaps have a cult-like following but I prefer the Sal Suds. I call my DIY cleaner “Sudsy Sal”. Soft ‘n Style 8 oz. Spray Bottles : I happen to like these smaller bottles and you can not beat the price for a set of 3. Likewise for these Pump Dispensers. Umbra Vapor Glass Soap Pump : I have been collecting glass pump bottles for years but you can also use re-purposed – you guessed it – soft soap bottles. Amazon has feature called Shop Amazon – Most Wished For Items. This is an easy tool for finding products that people are ‘wishing” for and in this way you know what the top products are. All you need to do is select the category from the left hand side of the screen. Help support Backdoor Survival. Purchases earn a small commission and for that I thank you! Are You Interested in Essential Oils? If you are just getting started in using essential oils for wellness purposes, I recommend the Spark Naturals Health and Wellness Kit which includes all of my favorites or the Essential 4 Pack which includes Lavender, Lemon, Melaleuca (Tea Tree) and Peppermint. Be sure to use the discount code “BACKDOORSURVIVAL" to receive a 20% discount. I’ve read multiple recipes along those same lines on frugal blogs. One just yesterday. I don’t think you should imply that people back off from using the name Dirt Cheap Soft Soap – you didn’t invent it, or the name. I don’t think she was implying she invented it and no one can use the name. I got the idea she was saying it’s just what she calls it, but you can call it whatever you want. Not everyone is greedy and out to be mean and nasty. We should give people the benefit of the doubt. Thank you Survival Woman for sharing your helpful ideas and tests. I did make a batch of of this soap using the Yardley $ store brand soap bar. I got 1/4 less than your quantity…perhaps because I did not whip it beyond a small froth. Does the soap retain any of the antibacterial properties of the lavandar essential oil in addition to the fragrance? That is an excellent question. My guess is yes – especially if you are generous with the amount that you use. And yes, my soap was pretty sudsy. Now the funny thing is that some batches stay that way while others settle down after a bit. There is no logic to it – which makes this so much fun LOL. If you are buying soap, doesn’t this defeat the purpose? I am looking for a soap I can make that does not have all the chemicals that are in soaps. I did do some research and the chemicals that this government allows in our soap is seriously dangerous. I didn’t just see the word “chemicals” I looked up what those chemicals were and it is mind-blowing the dangers that are in soaps. I know that the foaming dispensers are popular but I have not tried one. While reading the forums, I learned that a “thinner” soap worked best with these so you may need to add additional water. You can refill your foaming soap dispensers with regular hand soap you just add one or two teaspoons to the container and fill with water. the dispenser does all the work, so it’s a good way to stretch out your soap. I don’t see why you couldn’t make it work with this soap! Yep – that is all that you do. So easy and in brings out the inner chemist in you. Also, do not be afraid to experiment with scents/essential oils and different types of soaps. I made soap according to directions. 1 cup grated soap (I used Irish Spring), 10 cups of water and 1 Tbls of glycerin, and heated on medium heat till hot & disolved… BUT my soap is not thickening! It is staying water runny. I even took a small amount out and put in the fridge to make cold instead of room temperature. HELP! I do know that different soaps give different results. This happened to me with the batch I made this weekend (I am making extra soft soap for my friends) so I put it all back in the pot, added a tablespoon of additional soap flakes, and re-cooked the whole thing. I made sure the soap mixture was really dissolved this time. I left it in the pot overnight just to see if it would thicken up and it did – perhaps too thick. I don’t know if it was the additional cooking or the extra soap that did the trick but I would give this a shot. 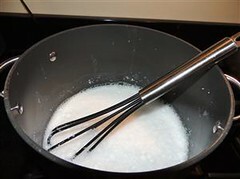 If it is still not thick enough, keep adding soap flakes 1 tablespoon at a time and re-cook. I got it to work! First, I was expecting it to thicken as soon as it cooled. That was not the case. Maybe its a combination of time & temperature? I split the batch in to 3. 1/3 in the cooking pan, 1/3 in a plastic bowl left sitting on counter top, and 1/3 in plastic bowl I put in fridge. The one in fridge thickened first, but it turned to “snot” consistancy even after beating with electric hand mixer until frothy. I had frothy snot! The plastic bowl thickened next with a tiny bit of slimy froth texture. The metal pan thickened last. It was not slimy or snotty! It took the longest, but turned out the best 🙂 thank you for your help! What are the ingredients in the soap flakes & bars you are using? I’ve looked many of those up & they are NOT good. You have to start with healthy ingredients from the bars & flakes, not halfway up the chain. Most have very unhealthy ingredients in them: sodium cocoate, polysorbates, fragrances, etc. I am going to try this today, but I don’t have glycerin. I read another recipe that calls for 6 tablespoons of olive oil. Have you tried this? I was also thinking of adding some moisturizer, but maybe the olive oil would be enough. Thanks for all the ideas everyone!! Glycerin serves as a moisturizer so olive oil might work. Seems to me, though, that it would smell. Be sure to let us know how it goes. I’ve made homemade soaps in the past as a hobby and you can use different oils; almond, olive, coconut, glycerin even vitamin e oil. Different oils have different properties. I will probably be trying this out soon to help cut costs some. I have 4 different foaming dispensers in the house plus the kids go through “body wash” like crazy. 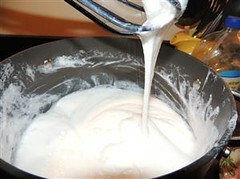 You can easily use regular soft hand soap for foaming dispensers, simply use about 1/3 soap to 2/3s water. Depending on the soap it might be too thick or thin, just add more soap if too thin and more water if too thick. Thanks for sharing this Gaye. I just finished making 5 gal. laundry detergent. I’m too tired to take on another task today, but maybe tomorrow. Love all the help that you give us as we learn step by step to be sufficient and able to sustain ourselves without depending on the grocery stores for everything. Thank you again. my soap is sooo runny! Its like it never got thick. What can I do?? Should I put it back on the heat and add more soap flakes?? Linda – Yes, definitely. What type of soap did you use? Some soaps work better than others. Using the Yardly soap, I had to add additional soap flakes in order to get the consistency I wanted. Using “hotel” soaps, it comes out perfectly every time. Good luck! 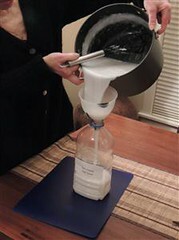 I’ve not long been making my products at home, but this is very similar to the method I use to make laundry detergent. Since I bought a jar of coconut oil for a recipe, I may try this with it. I also need to find a source for more essential oils. Lavender gives my wife headaches and we both love citrus, so that’s on my list. I love the simplicity (and the chemistry) of making cleaning products! I’m curious about one thing. My laundry soap has a tendency to separate between washing sessions (once a week). Does this separate? Thanks for everything you share, Gaye! I once made a double-strength batch of laundry soap and it too separated. And then another time, I did not use boiling water to dissolve the powders and the same thing happened. I now stick to the recipe and make sure the powders are fully dissolved before topping the jug with additional water. You can find links on my website to Spark Naturals for essential oils. Us the code BACKDOORSURVIVAL to get 10% off. I use their products exclusively for healing purposes. For soaps, I use the less expensive NOW Foods essential oils that I purchase on Amazon. Planttherapy.com inexpensive, decent essential oils…years later, but hey…it’s still good info for the next person if not you. Thanks for the recipe! I tried this using the Kirks brand coconut castile soap and NOW foods glycerin and it is SUPER thin, like water. I even tried again and cut the water significantly… still runny as water. Any thoughts? I love the idea of replacing hand soap, body wash, etc with this but I just can’t seem to get it. Thanks in advance for any suggestions! Carrie – Sorry for the long delay in getting back to you. Did you ever get this resolved? Most of us end up with a soap that is too thick, if anything. Something I have found is that the soap is a lot smoother if you let it sit in the pot for 48 hours before disturbing it. Let me know how things are going. I have not made the soft soap with Kirk’s but am willing to give it a try to see what happens. One more thing: the minerals in your water (or lack of) may be a factor. I plan to make a batch with distilled, mineral free, water to see what happens. I READ SALT WILL HELP THICKEN IT. IT WORKED FOR ME TOO MUCH HAD TO ADD MORE WATER. I for some reason have saved those sliver of nar soap that you just can’t hold on to in the shower. They are all the same brand. I just compress them in an knee hi stocking while they are still gooey. Once hard they make for a solid bar. Do you think thease bars will work? Karen B. To frugal you think? Karen – No no no! Not too frugal!!! I have an article coming up (possibly as soon as next week) on rebatching soap from scraps (as well as from new bars) and making hand crafted artisan soaps. You know the kind. They sell for $5 a bar at craft fairs. My initial batch was not pretty but they have turned out to be the best darn bar soaps we have ever used and they smell heavenly. Keep on saving those scraps. By the way, I use shampoos that I don’t care for as body wash. I just hate to throw them out and because they are used, they can not be donated. You can get glycerin in gallon jugs at the Veterinary supply stores. Use a local one, because shipping can get pricey!! Mine is “snot-like” no mater how much I whip it. Is it the soap? I used Ivory. Thanks! Could be. I really should get some Ivory and try it. Have you tried re-cooking it? If not, after doing so, let it sit totally untouched for at least 24 hours. If you have done that already, grate a bit of additional soap then re-cook the batch. To be honest, I have never had a batch that could not be salvaged. I am going to try this! it sounds too easy. My mother in law made soap the old fashion way with lye and I believe fat. It was always too greasy. I just have one question..How long will it store up to? We are prepping and this would help a lot. I make huge batches and store it in large mason jars. My latest batch is over six months old and still going strong. This is my experience and you mileage may vary depending on storage conditions. Perhaps someone that lives in a warmer, more humid climate with respond. One more thing. I wait to add my essential oils each time I fill my pump bottle. Hi, this seems great and too good to be true…lol. Thanks for sharing. If I leave out the pot long enough, maybe a month, will it thicken to form a bar soap? Also when I tried it the chunks of soap didn’t melt. I used Irish spring but left out the glycerin as I didn’t have some on hand. What could be the reason for the soap not melting and what can I do differently? Thanks for the recipe! I too save hotel soaps and my husband recently put them all in a bag. I think he was trying to say “enough with the hotel soaps” but it only freed up room under the sink for me to collect more soaps! I’m going to make this as soon as I run out of liquid soap! I was concerned about the “shelf life” but I think your idea of grating the soaps and storing that is wonderful. I’ll probably place the recipe on a tag and attach to several of the mason jars that I store of grated soap. Great ideas! What all do you use soft soap for besides hand washing. Showering? Cleaning products? I just use it for handwashing. SPARK Naturels oils — $19;99 for 20 mls ??????????????????????? My mother grew up during the Depression and we always saved slivers of soap in a smallish, empty jar filled with water. (I like the Bookbinder cocktail sauce jars because they have plastic caps, not metal that can rust.) We used the soap mixture to hand wash stockings and underwear. I still do this with the hotel left-over soap. As you said, you paid for the soap so take it home with you. I have glycerin bar soap. Suppose I wouldn’t need to add glycerin then?